Wife, Esq. has vetoed my revolutionary new childrearing idea: house-proofing the babies...something about giant plastic hamster balls making the diapers hard to change. So, instead we have to babyproof. I think the key item in the short term is one of those kid jails. If we get two and assemble them together, we can pretty much corral off the whole middle of the play room. Plenty of room for both of them to lift weights, play the harmonica, rattle their sippy cups against the bars, and fashion shivs. Anyone have anything positive or negative to say about this one, or any alternate recommendations? We had the plastic one so that we could use it indoors or out. It didn't look as nice but it was temporary as we found Alex was intent on getting out of any baby jail. We also used pack and plays to keep them contained in other parts of the house. For example, solo bedtime routine became much more challenging once they were mobile so we would stick one in a PNP while attending to the other. We love our Superyard. The nice part is you can use it in so many different configurations. In a loop to create a playpen, or unfolded in a variety of shapes to create a barrier where you don't want them to go (computers, TV stand, etc.). We have 2 of the metal superyards and I LOVE LOVE LOVE them. Our old house was a very open floor plan and was difficult to gate off, so we bolted each end to a wall to partition off the play room. We hooked them both together to create a big play area when we were cleaning the carpets in the playroom. 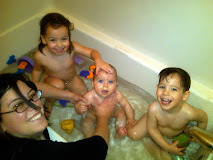 We've taken them on many trips and they were always adaptable to the space we were trying to babyproof. 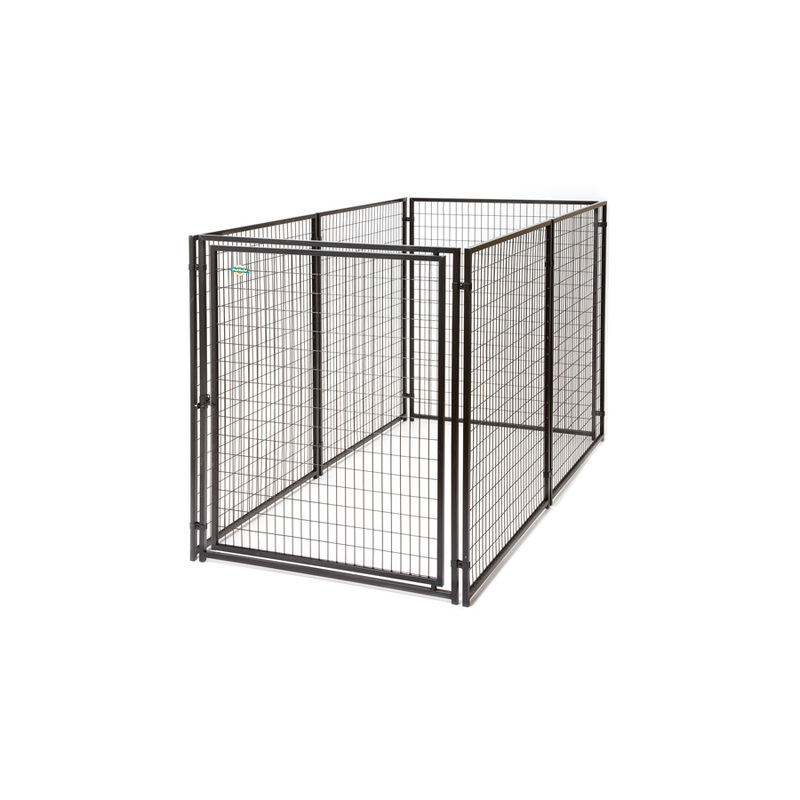 They are a little taller than normal gates and are VERY sturdy, so even now they still can't climb over the gates. We don't have the playroom gated anymore, but we have one around the fireplace and the other around the tv. The one downside is that they are pretty heavy and cumbersome to transport. The wood is probably lighter though. Good luck! We have the plastic version (complete with music & toys) from OneStep Beyond by way of a consignment sale. LOVED IT. Our twins recently turned one & we actually just took it down to make room for their birthday party and haven't put it back up. We gave them a little more freedom, but instead put up a baby gate at one door. I will be adding a piece back to go in front of our fireplace. It really came in handy when you needed to leave them to use the bathroom, start dinner, do laundry, etc. What it did end up being useful for was for blocking things off when the kids were toddlers. We'd separate off 3 or 4 sections and use it to block off bookshelves, etc. Not that the kids couldn't move it...they could. But they quickly learned to respect the gates and wouldn't move them even though they physically could. I don't know why it helped...I mean, if they'd listen to "don't move the gate", I don't know why they wouldn't listen to "don't pull the books off the shelf", but there you go. ooh - that one is pretty. :) We just went with the plastic ones - useful for inside and out. Well,finally, sensible parents of babies/toddlers who move! Congratulations on thinking about what we used to call playpens--couldn't have lived without them, but, somehow, they went down into neverneverland in the last 2 generations--and look at the results! No boundaries, no limits, no safety, constant "hovering" (I just heard the expression that today's parents are called "helicopter parents"--God help them (and their kids)! They will learn to use whatever is in the jail to stack up and climb over. Nothing works - just resign yourself to racing after kids all the time once they are mobile. We had the plastic version, plus a couple of extensions. We still use it to gate off the backyard and used to use it on the basement stairs (at the bottom). 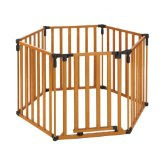 For us, it worked better to gate off a couple of rooms---our playroom and kitchen---and completely babyproof in there. It was plenty of space for the kids to run, well, ok, crawl, for months and a safe place for me or a sitter to leave them. We just had gates at each of the doorways out to the living room/stairs etc...We never even had to gate the stairs, because by the time they were loose from "their" rooms, they had passed the climb the stairs stage. You might want to consider the belt and suspenders approach - do both houseproofing and babyproofing. Alternatively, you might kick the houseproofing up a notch with something like this Baby Minder. Also, you might want to take another look at "Shawshank Redemption" for home improvement ideas to enhance security. I had the plastic for both of my boys. We used it to keep them in both inside and outside. Then, we also used them to keep the out of certain areas. I would highly recommend them. we have the metal superyard and love it. we use 1 screwed into the wall at each end to block off the computer in their otherwise "safe-zone" playroom. we use the 2nd to block off the top of our stairs. the metal one is pretty heavy and so far has stood up well to them pulling up on and shaking it like two escape-crazed jailbirds.